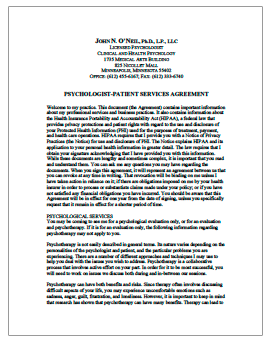 Patient Forms — JOHN N. O’NEIL, PH.D.
Below you will find my patient forms for you to review or print at your convenience. To expedite your initial appointment, please bring a signed copy of the Patient Agreement form with you to your appointment. * Downloadable forms are in PDF format. You can download Adobe Reader (click here) for viewing, if necessary. Click on the form that you’re looking to view or print.